TS DSC Notification 2018 Latest News: The Telangana Public Service Commission is going to release the New DSC Notification in Telangana 2017 for 8792 Teacher Posts. Interested candidates can refer the eligibility for Telangana DSC Recruitment 2017. Eligible candidates can apply for the TS DSC Teacher (TRT/TST) Jobs through online @ www.tspsc.gov.in. Scroll down the page for the TS DSC Subject Wise Vacancies, DSC Vacancy List Cast Wise, Selection Process, Application Procedure. Here is the Latest News for the aspirants who have been waiting for the DSC Notification in Telangana. From the last one year, this Teacher Jobs Notification postponed. At last, the Director of School Education (DSE), Telangana has approved to release the TS DSC 2018 Notification very soon for filling 8792 Teacher Posts in Government schools. These TS DSC 8792 Vacancies are going to be filled across 31 Districts in the Telangana State. We have tabulated the TS DSC District Wise Vacancies in the below section. So, have a look at the below sections. The District Selection commission (DSC), Telangana will organize the TRT Exam 2018 to select the candidates to the Teacher Vacancy in Telangana Government Schools. The entire information of the TSPSC DSC Notification 2018 such as eligibility, selection criteria, etc is mentioned clearly on this page. Physical Education Teachers (P.E.T), in Government, Zilla Parishad, Mandal Parishad Schools under the control of Tribal Welfare Department and Municipalities in the Telangana state through District Selection Committee. This the DSC vacancy list in Govt, Zilla Parishad & Mandal Parishad Schools which are in the control of Tribal Welfare Department & Municipalities in the Telangana state through DSC (District Selection Committee). For the TS DSC Vacancy List Cast Wise, aspirants can check the official TS DSC Notification 2018. 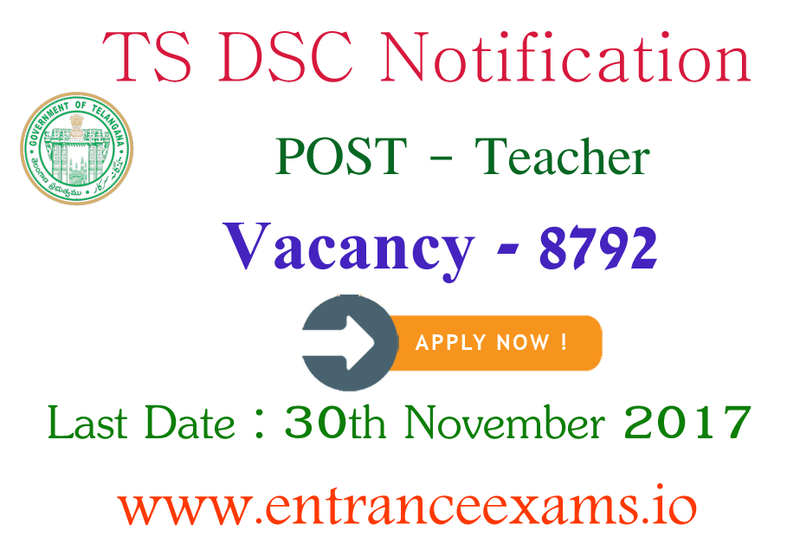 One should confirm their eligibility before applying to the TS DSC TRT/TST Teacher Posts. Hence, know the educational qualification and age limit requirements of the Telangana Public Service Commission from the below sections. Maximum age – 44 Years. As per the norms of the Telangana Govt, the Upper age relaxation is applicable to Reserved Category (BC/SC/ST) candidates i.e., 49 years. Applying candidates should possess Graduation & B.Ed or TTC with minimum qualifying percentage from the recognized university. Also, the postulants should pass TET Examination. The candidates who applied for the TS DSC Notification 2018 will be selected based on the following test. For the successful completion of the TS DSC Vacancy 2017 Application Process, the aspirants have to pay Rs.250/- for the Processing Fee and Examination Fee. The Telangana Public Service Commission will offer the best pay scale for the selected candidates. Refer the TS DSC Notification 2018 for the salary details. At first, open the Official website www.tspsc.gov.in. Or, click on the direct link attached below. Look for the TS DSC Notification 2018 link on the homepage. Open the advertisement and read the instructions carefully to confirm your eligibility. If eligible, fill the Telangana DSC Online Application Form with the correct details. Cross check the details once you proceed to next step. Then, make payment through online. Take the printed copy of the TS DSC Teacher Recruitment Application form for the future purpose. Closing date for applying online – 30th November 2017. Telangana DSC Exam Date – update soon. TS DSC 2018 Admit Card issue date – update soon. TSPSC DSC Result release date – update soon. We have shared the complete information of the TS DSC 2018 Notification here. If you found this article helps, please pass the information to your friends. Stay tuned to our www.entranceexams.io website for the TS DSC Latest News.